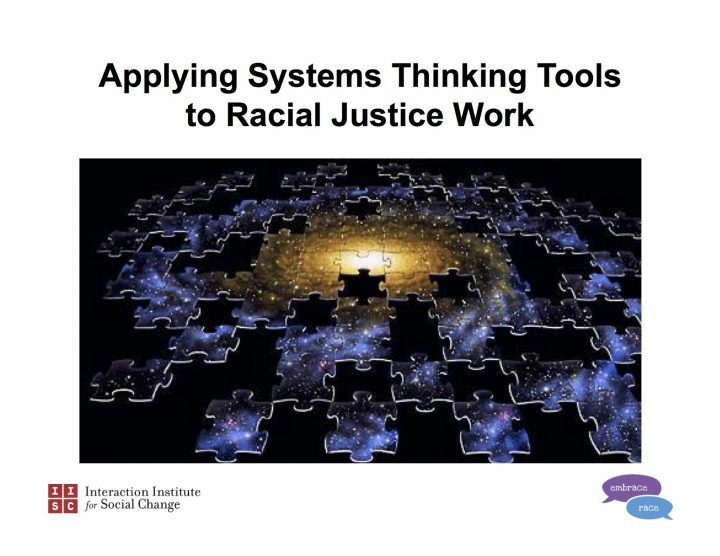 A few months ago, Andrew Grant-Thomas of EmbraceRace and I presented an interactive session at the Facing Race Conference in Atlanta on systems thinking tools to address structural racism. We had offered a similar session at the 2014 conference in Dallas with our colleague Cynthia Silva Parker, and as it turns out, both sessions were done in a standing-room-only situation. Clearly there is a hunger for these skills and tools among racial justice advocates. 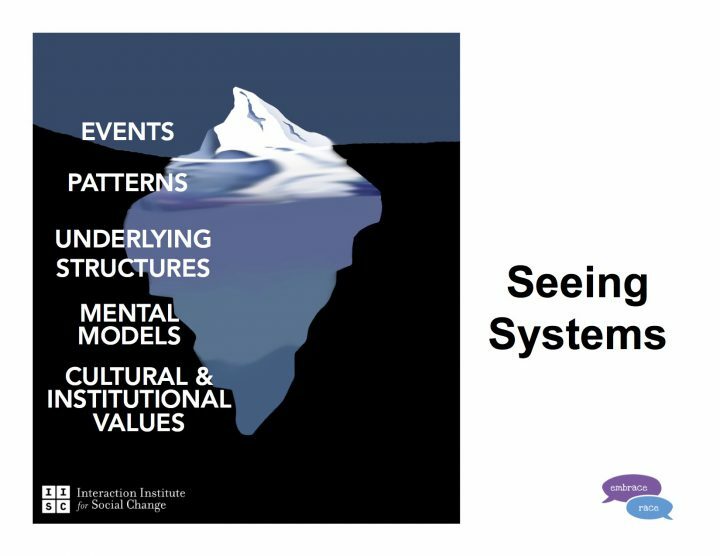 Systems thinking as a field has been around for a few decades, but its direct application to structural racism has not been widespread. Even where racism has been discussed systemically, activists have often craved practical skills and tools to identify and align strategically around areas of intervention that will yield the greatest return for effort. 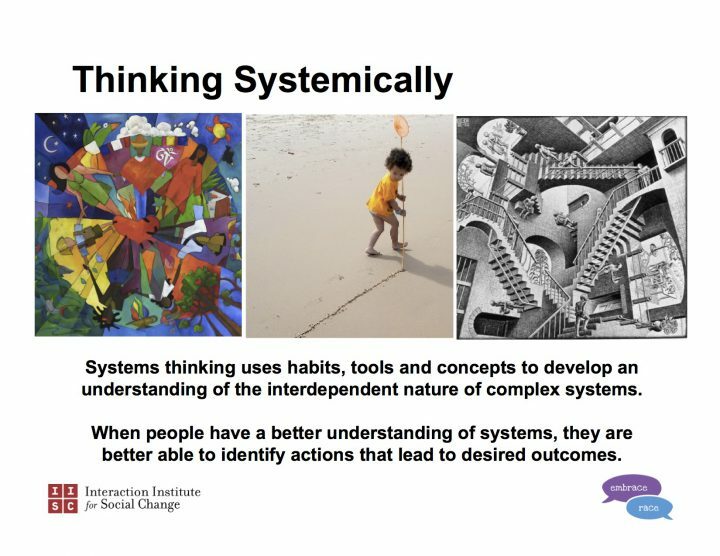 In our session in Atlanta, we spent some time talking about and exploring the “thinking” side of systems thinking. We presented a few systems thinking sayings and quotes from different writers and practitioners, and invited participants to read and reflect on them and talk with others about the ones that most caught their attention. A specific request was to pay to attention to how the words impacted their thinking and perspectives. There were, in just the span of about 10-15 minutes, some remarkable insights reported. And so I invite you to do the same, to share any impacts, and also to add your own favorite systems thinking sayings. Hi Curtis Ogden” i really enjoy to read this beautiful article it is very informative for me thanks thanks again for this beautiful post !